he Bhagawad Gita was delivered by Lord Krishna to the warrior prince Arjuna on the battlefield of Kurukshetra as an antidote to the dilemma that arose in him. It was not a choice between right and wrong, rather it was dilemma between the 'apparently' right and 'absolutely' right. 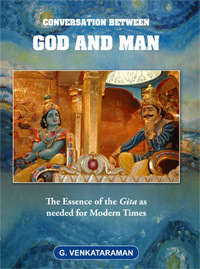 Five thousand-odd years later the wisdom of the Gita is still not lost in context in modern times. In fact it is more relevant and needed now than ever. Submitting my humble Pranaams at Bhagavan’s Lotus Feet, I also offer my greetings to you. I am really grateful to you all for being with me in this journey of exploration through the greatest Spiritual treasure of mankind. This is my fifth talk in the series Musings on the Gita. You will recall, I am not giving you the usual land-tour if I might call it that. Instead, I am offering a helicopter ride, pointing out all the time to Mama Dharma, from a certain height, if I might put it that way. Thus far, we have flown over, shall I say, four chapters. Today, a quick flight over Chapter 5, after which I would like to pause and do a bit of review. Now for some comments on the above. 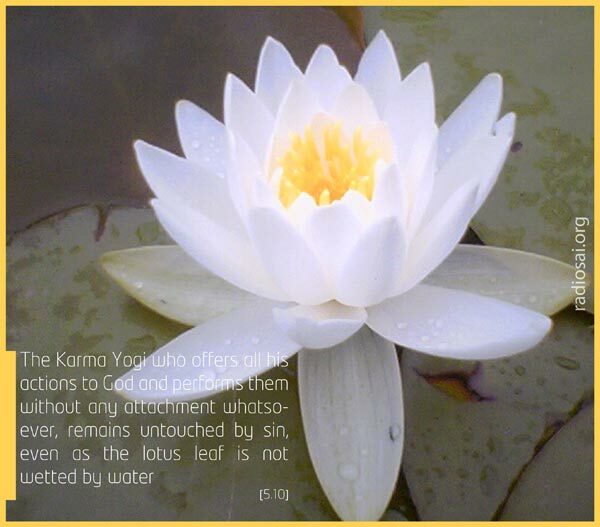 Chapter 5 is entitled Karma Sannyasa Yoga, and it also is largely about duty. 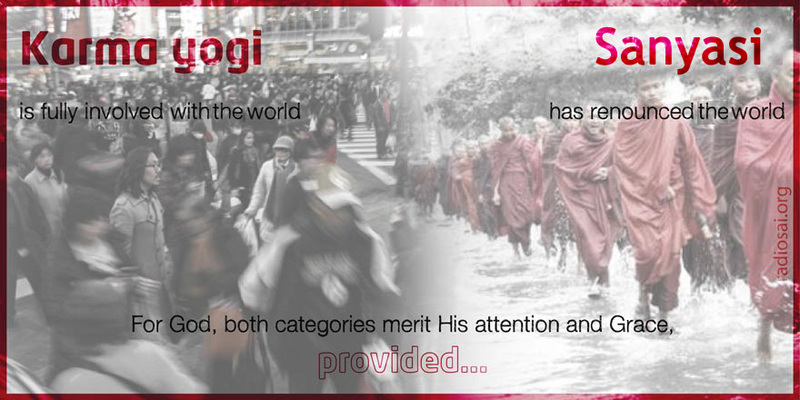 However, it adds important nuances, highlighting two different ways of becoming one with God. Remember, Yoga means becoming one with God and also that the purpose of life is to become one with God. Chapter 5 says that some achieve this union through Karma Yoga while others follow the path of Sankhya Yoga; two roads but same destination. What then are the differences? Ah! As always, there is a fine print! What is that fine print? That is what we shall now examine. The first thing we must appreciate is that the world is after all the Lord’s creation; so there is no meaning in dismissing it as useless etc. The Lord does not expect everyone to withdraw to the forest and meditate on Him. Mind you, He does not rule that out either. He says, “Son, if you want to go to the forest and meditate, by all means do so. 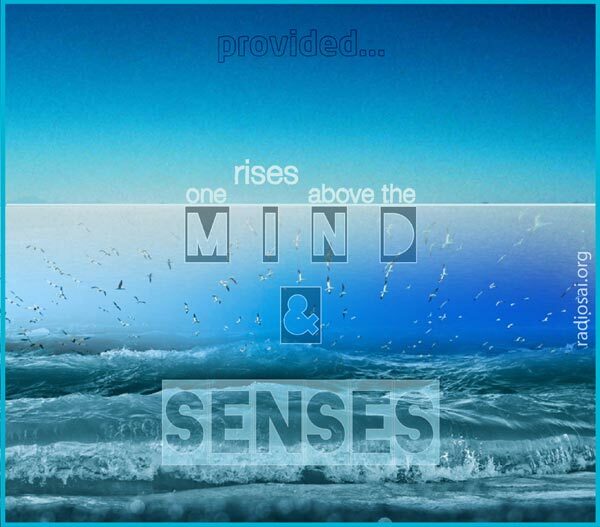 But that does not exempt you from Mind and Sense control, and give you the license to ignore your higher nature.” In other words, it is rising above the senses and the Mind, and being true to one’s nature that is really important, and not whether you follow this path or that. The choice of path is largely a matter of convenience and of circumstances. That is the beauty of the Gita; everyone has a chance to follow Mama Dharma, each according to his or her level and circumstance. There is a beautiful Upanishad story that exemplifies this point. It goes like this: There lived in the forest a Yogi. Every morning, he used to go to river to have his bath there. This river being near a village, would also have many residents of the village coming to it to have a dip. One day, a villager saw a strange sight. A scorpion had slipped from the riverbank into the river and was struggling. The holy man who was bathing, saw the struggling scorpion, picked it up with his fingers to rescue it. Even as he did so, the scorpion stung him. Unmindful of that, the man gently deposited the scorpion on the riverbank and resumed his bath. This story tells us a lot, and I would urge you strongly to spend some time thinking about what that story conveys. It is a reminder that man must act in full awareness of his true nature. Of course, in this case the Yogi was doing it his way; and that is the real point of the story, and not that you must get repeatedly stung by a scorpion! If you think about it, being true to our REAL nature is really what Mama Dharma is all about: To do one’s duty in the situation one is placed in life, keeping the permanent in view always – that is the bottom line. 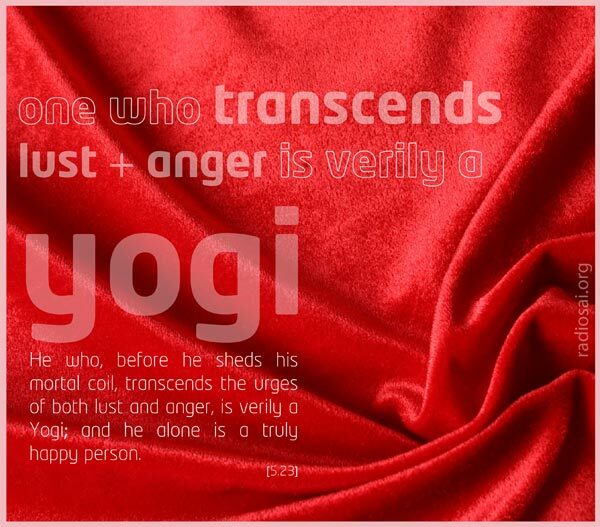 The Yogi in the Upanishadic story is above body consciousness and therefore always returns good for evil. The story has a message no doubt but we should not jump to the conclusion that one should necessarily retreat to the forest to overcome lust and anger. What the Gita teaches us is that one does not have to be a formal Sannyasi to act in that manner. The bottom line is to give up attachment and overcome lust and anger. That, one can do anywhere, not necessarily in a forest. In fact it is much better to do it while immersed fully in so-called active life. Thus one can be a doctor, a lawyer, an accountant, an airline pilot, or whatever, and still practice the basic human values of Sathya, Dharma etc. If one always does one’s duty selflessly and strictly adheres to these values, then one is in fact adhering to Mama Dharma. What Krishna tells Arjuna in Chapter 5 is that the Karma Yogi as well as the Sannyasi are both dear to Him because both have risen above the senses; that is to say, both have their senses and Mind under control. There may be a difference in their action styles but what really matters to the Lord is sense and Mind control, and rising above baser instincts. If you remember, Jesus went into meditation when the Devil tried its best to trap him. But he resisted, came out absolutely pure, and then preached the famous Sermon on the Mount. Getting back to Chapter 5, as I told you, the Karma Yogi does not lead the life of a recluse; on the contrary, he is very much in Society. However, he is perfectly detached, especially where work is concerned; that is to say, he is concerned solely with the discharge of his duty and not with either reward or even success. Further, while doing his duty, he sees God in the persons he serves. He does his work with joy in the belief that he is doing it to please God. Offering all his actions to God, he rests content in the belief that whatever happens is God’s will entirely and always for the good, though that might not always be apparent. The Sannyasi, on the other hand, leads the life of a recluse, mostly looking inwards, focussing on the Indweller. Does that mean he shuns Society? Not really; in fact, when necessary, he guides ordinary people on Spiritual matters; in that sense, the Sannyasi too discharges duty. This illustrates how Mama Dharma works in practice. The two people are in very different situations; one is very much immersed in Society while the other is a recluse. However, when it comes to action, both are detached and perform their actions for God’s pleasure, meaning they do what they have to, keeping the permanent in view rather than the transient. The bottom line is the same, though the procedures adopted might vary according to circumstances – that is an important aspect of Mama Dharma that we must always keep in mind. Leaving Chapter 5 behind, I would now like to touch upon two points that I have so far not given much attention to, both of which relate to Chapter 4. The first concerns the incarnation of God as an Avatar while the second is about the Cosmic nature of man and his Cosmic connection with the Cosmos itself. As far as I know, Chapter 4 is where God directly declares for the first time why and when He incarnates. This is an important point. The Krishna Avatar was certainly not the first Incarnation of God as an Avatar, but it is certainly as Krishna that the Lord explains why He incarnates and when He does so. Naturally, the pertinent Slokas are quoted often. However, these Slokas by themselves do not tell the full story. 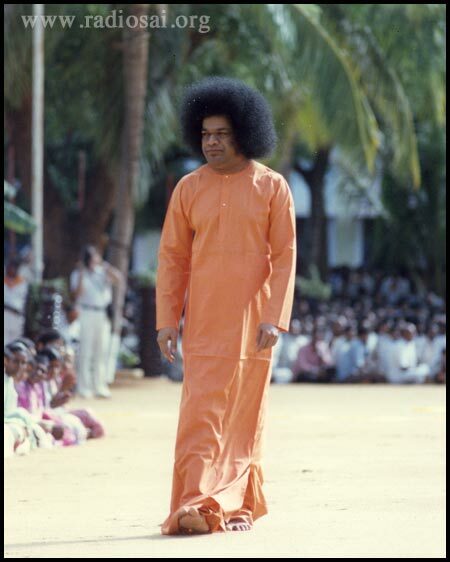 It is Swami who, over the years, has drawn attention to many of the subtle nuances of God coming down in human form. Some of these were recently compiled and offered to you by our Sai Inspires service, in one of its Sunday Specials. Here I would like to draw particular attention to some aspects of God coming down in human form, especially because of some common misconceptions. Let us start with Swami’s remark and go over it bit by bit. Yes, Swami has declared at times that He is God. Those who quote this remark invariably fail to quote the rest of the statement; Swami says, “I am God but then you also are God. The only difference is that I know I am God while you do not.” In fact, it is to lay emphasis on knowing our true and intrinsic Divine nature that Swami often discusses in His Discourses the question: “WHO AM I?” Now all the great Pundits, self-styled scholars and rationalists who are ready to scoff at Swami conveniently quote Him out of context, and that too only a part of Swami’s statement. Moreover, these critics make no effort to understand the full import of Swami’s remarks. How then can one call it objective criticism? In view of the widespread ignorance about the whole business of Sai Baba supposedly describing Himself as God, I wish to devote some time to that topic. First and foremost, we must appreciate the fact that everything in the Universe is a reflection of God. This is what Vedanta declares and to give weight to that Swami on occasions goes to the extent of asserting that there is only God and nothing but God –some of you might have heard Swami saying that in a few of His Discourses. People, especially hard-boiled sceptics, might shake their heads and say: “If we look around, we see trees, houses, people, animals, clouds, mountains, stars, etc. How can we say all this is God?” Believe it or nor, the first time Swami Vivekananda heard this from Ramakrishna Paramahamsa, he too felt he was being taken for a ride! Vivekananda describes all this, but that is a different story. Supposing I tell you that all that you see around you, above you and below you, the people, the animals, the mountains, the rivers, the stars, galaxies, and the earth below, the oil underground, etc., is made up of atoms. You can’t say I am wrong, can you? In the same way, when Swami says that everything is God, what He really means is that the source of everything in Creation is God, meaning that everything came from the Creator. That is point number one. OK, agreed everything came from God; so what? The answer to that is that just as every living being carries genes from its parents, every entity in Universe carries what I would call a Divine Spark, meaning a subtle but a definitive imprint of Divinity. In the Gita, Krishna explains that everything came from Him, and that He is in fact the seed of all that is in the manifest Universe. Krishna further adds that the wonders that one sees everywhere all spring from Him and reflect His Glory. He then goes on to say that not only miracles in the human body, for example, but even Goodness spring essentially from Him. Thus, where Goodness shines in the form of noble virtues like Selfless Love, Compassion, Forbearance, Non-violence, etc., there may be seen His Radiance. Everything in the manifest Universe has the imprint of Divinity, or Divine Genes, if we want to use modern jargon. These genes, however, are subtle and not made up of atoms and molecules. 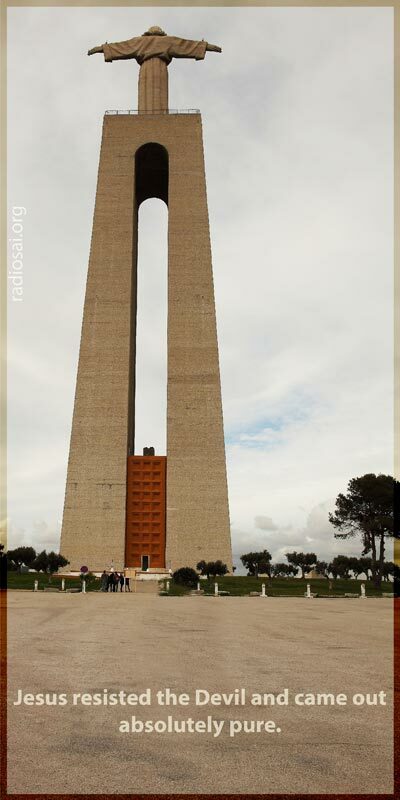 Nevertheless, they can and do make their presence felt under appropriate circumstances. Humans alone have the capacity to cognise the latency of Divinity within; that capacity comes from the Divine Genes that I just mentioned. Indeed, humans have the duty of recognising God within, and that in fact is why God gives the blessing of birth in the human form. To put it bluntly, human life is not meant to be frittered away by having a ball, as many think they should. Rather, it is meant to first recognise Divinity within, and then make that latent Divinity to become the guiding star of one’s life. Incidentally, making the latent Divinity patent, and finding expression in human life through acts of nobility, pure love, compassion, etc., is really what Educare is all about. When Swami raises the question: “WHO AM I?” what He is doing is to make us re-examine our real roots and act accordingly. I hope it is all clear. 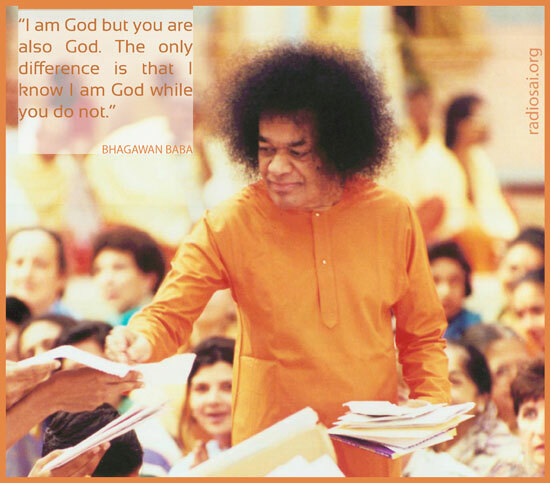 When ignorant people take objection to Swami declaring Himself to be God, they simply do not understand the nuances. It is to remind humans of their intrinsic Divine nature that Swami says, “I am God but so also are you. The sooner you realise the better it is for you and for humanity.” Take a minute off to appreciate this last remark of mine. Suppose there were a million persons on earth today with say 10% understanding of their true nature. You know how much of Love power that would release? Do you realise how much misery and sadness it can wipe out? Can you imagine how much comfort it can give to those who are suffering and feel helpless? When someone comes unexpectedly and helps them, it would make them realise that it is God in human form that has come to help. Yes, it is a gross understatement but then how many devotees know what the facts actually are? I am sorry to say, very few. 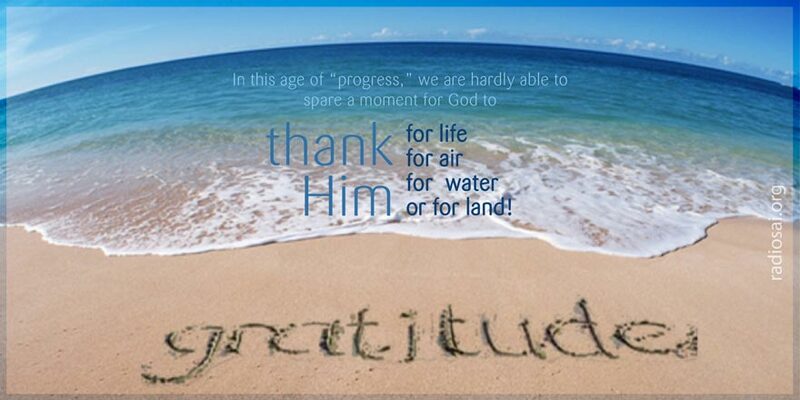 Once upon a time, humans expressed gratitude to God every single day but in this age of “progress,” we are hardly able to spare a moment for God to thank Him for life, for air, water and land; and yet have the time to stay up all night to watch soccer matches or whatever. However, we do not even have the time to know what exactly the Avatar has done for mankind, let alone be grateful. Do we bother to realise that while we are so immersed in self-indulgence, the Avatar, cannot and will not take one day off? Getting back to the Gita, you will notice that all that I said earlier once again boils down to a stress on Mama Dharma. 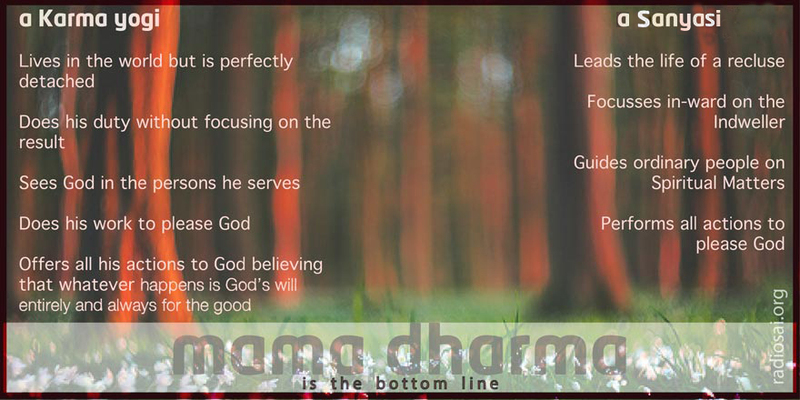 That is inevitable since the bottom line of the Gita is just two words – Mama Dharma. Let me now turn to the other point that I promised, and that concerns the Cosmic nature of man, the Cosmos and the Cosmic connection between the two, that is, between man and the Cosmos. As it would turn out, this two is linked to Mama Dharma! Yes, there is no escape from Mama Dharma!! OK, what is all this about the Cosmic nature of man, etc.? Very simple really. God created the Cosmos, God created man as a part of the Cosmos, and therefore, not only both man and the Universe share common genes, but also have a unique relationship. It all might sound very strange, but that is because we seldom think about such matters. That is why Swami has given this topic much attention in recent times. You might protest and argue that Swami has not referred to the Cosmic nature of man, etc. I agree that He did not use the words that I have used; Swami has instead used the words: Vyashti, Samashti, Srishti, and Parameshti, meaning Individual, Society, Creation and God respectively. If you think about it, the words I have used and the words Swami has used are closely related. What exactly has Swami said concerning Vyashti, Samashti, Srishti and Parameshti? He says that the individual’s actions must first be such that they do not harm Society. Why? Because Society is God! Anything else? Of course; Swami says man’s actions must also not harm Nature. Why? Because Nature too is God. If you think about it, both these caveats essentially tell us that our actions must keep the permanent aspect, namely God, always in the foreground. And isn’t that what Mama Dharma is all about? Of course; and Swami is stressing these ideas because these days, thanks to technology and high population density etc., actions of the individual can harm Society; and often also harm Nature. Here is an example, these days an oft-quoted one. Let us say I have a car that spews out a lot of smoke. Obviously, the smoke would pollute air and harm people who are forced to breathe that air. In short, my driving a junk car that pollutes causes considerable harm to Society. In addition, the carbon dioxide emitted in profusion by my lousy car also contributes to global warming that hurts both Society and planet Earth. So you see, the terse comments of Krishna made five thousand years ago, have been expanded and placed in a modern context by Swami. If we read Swami’s Discourses carefully, we would find how beautifully He makes ancient teachings so very relevant to modern times. 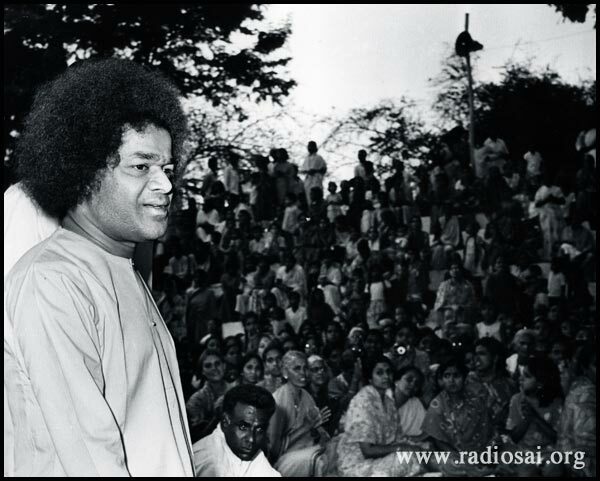 Indeed it is in this spirit that Bhagawan says that Higher Learning must teach students to seek the Atma in Society and in Nature and act accordingly. In other words, as far as Swami is concerned, He has established His Institute not merely for giving free education and awarding degrees like M.Tech and Ph.D but more so for making His students to learn Mama Dharma. Before we do anything, we must first lock on to our intrinsic nature, that is to say, be conscious of the Divine spark within. Next, using the pipeline of Buddhi, we must consult our Conscience to make sure that our proposed action is free from selfishness etc. We must then engage in the action concerned, making it a loving offering to God. If we march through life in this manner, always keeping God on our radar screens, then we can be assured that He would always be with us. How do I know? Because He Himself has given this guarantee. That comes in Chapter 9. I hope you would be with me at least till then, to know more about this irresistible deal offered by God! Thanks for listening. Jai Sai Ram.